A Mars Express HRSC 3D perspective view of Candor Chasma (in false colours) characterised by the infrared images of OMEGA. It shows bright and brown deposits (arrowed) that are rich in the mineral kieserite, a hydrated magnesium sulphate. New observations of Mars' interior have revealed a crater hidden from the surface and new information about ice below the polar cap. Fresh research announced today also finds chemical signatures of past water on Mars that add to other evidence suggesting a wet past. Scientists have long held that the deep channels and signs of extensive aqueous erosion are evidence that Mars was once a watery world. But these geologic signatures alone are not enough to confirm that liquid water was stable on the planet's surface for extended periods of time. Liquid water is a key ingredient to life as we know it. While there is no firm evidence that biology has ever existed on Mars, scientists are seeking locations that may once have held standing water as logical places to search with future missions. Today researchers on the European Space Agency's Mars Express team announced they have detected minerals on Mars' surface that could only have formed from long-term exposure to large amounts of liquid water. Over the last 18 months, scientists at OMEGA - Observatoire pour la Mineralogy, l'Eau, les Glaces et l'Activite in France - have used the visible and infrared mapping spectrometer on board the spacecraft to map nearly the entire surface of the planet. During this time, the instrument detected the two different classes of hydrated, clay-like minerals over large, but isolated, regions of the planet. Phyllosilicates, one of the minerals discovered, form when molten rock is chemically altered by long-term contact with water. Phyllosilicates were spotted as dark deposits mainly in Arabia Terra, Terra Meridiani, Sytris Major, Nili Fossae and Mawrth Vallis regions. The second type of mineral, hydrated sulfates, are formed as deposits from salted, generally acidic, water. These were seen in layered deposits in the vast canyon Valles Marineris, the Terra Meridiani region, and within dark dunes in the northern polar cap. "An early active hydrological system must have been present on Mars to account for the large amount of clays, or phyllosilicates in general, that OMEGA has observed," said OMEGA principal investigator Jean-Pierre Bibring. After analyzing the surrounding areas, the OMEGA team determined that the phyllosilicates were created more than 3.8 billion years ago. The hydrated sulfates would not require as much time to form, but acidic water must be present. The mineral-rich regions could be interesting places to explore with future missions, said Bibring, who presented a map of Mawrth Vallis region where the water-rich minerals, shown in blue, were detected. "All the blue spots are where we should go in the future," Bibring said. Researchers with the Mars Advanced Radar for Subsurface and Ionospheric Sounding instrument on board the orbiter also presented their observations of the northern polar ice cap and evidence of subsurface ice, which is published today in the online version of the journal Science. From the reflection and absorption intensities of the 1.8-kilometer-thick ice cap, they have determined that it is nearly pure water. 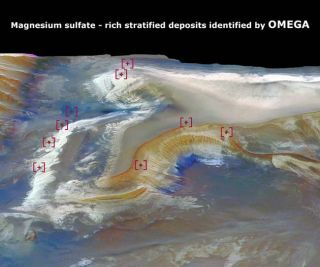 "The dust component must be very small - two percent or less based on absorption," said MARSIS co-principal investigator Jeffrey Plaut. The low frequency radar instrument also revealed a buried crater basin in the northern Chryse Planitia lowlands. Although the giant crater is nearly 250 kilometers in diameter, it is shallowly buried and invisible on the planet's surface. Additional MARSIS radar probes have shown a 1-kilometer-thick deposit of material in the basin that has the characteristics of ice, suggesting that water once flowed into the crater. "We have no convincing evidence yet of subsurface liquid water," Plaut said, adding that it is very early on in the search. "However, we can certainly say that we have seen significant amounts of subsurface water in the form of ice. The search for liquid water will begin in earnest next year."